4v4 COED - TEAMS MAY HAVE AS MANY FEMALE PLAYERS ON THE COURT AS THEY WOULD LIKE, BUT THERE CAN BE NO MORE THAN 2 MALE PLAYERS ON THE COURT AT 1 TIME. Sand volleyball matches consist of 3 games. Games are scored rally-style with the first two games played to 21 and the third game to 15. Playoffs are best 2 out of 3 games. The Spring Novice Tuesday season will play at Foundation Tavern starting May 7th. Games will begin at 6:30pm each week and play into the evening. During the regular season, teams will play all 3 games regardless of the outcome of the first two. Substitute players must sign waiver before playing. Only subs that played during the regular season are eligible for playoffs. Teams may not have more subs than full time players on the court during playoffs. There may be cases out of the control of Lehigh Valley Sports Leagues that require schedules and/or venues to change. Lehigh Valley Sports Leagues will make every effort to maintain schedules and locations. There is no guarantee on number of games, times and locations. The winning team in the league will receive a gift card back to Foundation Tavern. 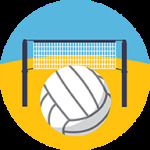 Check out this Volleyball (Sand) league '19SPR - VOLLEYBALL SAND NOVICE COED (RATIO 2:2) - FOUNDATION TAVERN (TUESDAYS)' with Lehigh Valley Leagues!